Nerve Pain is a syndrome, which affects people suffering from diabetes. It can affect both type 1 and type 2 diabetic patients. This condition is one of many complications of diabetes, and may be also called diabetic peripheral neuropathy or diabetic neuropathy. The pain in nerves occurs when a diabetic patient has prolonged spells of high blood sugar levels, which can damage the nerves without becoming obviously hyperglycemic. This condition usually occurs in peripheral regions or extremities, such as feet and legs, as well as hands and arms. The term “the diabetic foot” is related also to it. Burning, sharp, stabbing or shooting pains are the usual symptoms. These can range from mild to severe, and in serious cases the whole area is numbed. Unfortunately, the nerve pain in diabetics is a very serious condition. In its earlier stages, it can influence the daily activities like walking, or working with the hands. In the later stage, it can make even standing difficult. Because diabetes is a chronic disease, it is considered to be lifelong companion. Therefore, sometimes a diabetes complication like nerve pain takes time to be cured, and you may want to try different treatments and medications before finding one that works for you. At first, make sure you are controlling your blood sugar , practicing light exercise regularly, and watching your weight carefully. If you still suffer from pain, numbness, and discomfort in your extremities (this is called peripheral neuropathy), you might need to try medications to relief your pain and help you to sleep. It is up to your weight to determine the risks and benefits of a drug, which is given to your own medical condition. Anti-inflammatory drug: reduces inflammation, which is the body's natural response to injury. Non steroidal anti-inflammatory drug (NSAID): reduces both pain and inflammation, as inflammation increases pain, so the drug that reduces inflammation can also help to relief pain. Fortunately, a balanced diet which helps to treat nerve pain doesn’t really differ from the standard diet advised by the American Diabetes Association (ADA). Diet and diabetes go together like salt and pepper, and for better or worse. Good glucose control can protect the health of your nerves, and may even help prevent diabetic neuropathy, says the National Diabetes Information Clearinghouse (NDIC). 1. Eat a balanced diet, which helps you to keep your blood glucose level within normal, as well as controlling your weight, and reducing the risk of diabetic complications. 2. Spread your meals throughout the day as skipping meals and overeating can raise your blood sugar. 3. Go for complex carbohydrates , because they are slowly digested, and they give you more vitamins, minerals, and fibers. 4. Forget ‘Supersizing’ - Don’t be shocked to realize how small official serving sizes are. Just try to stick to the diabetic exchange list and to the healthy diabetic food. 5. Jump on the wagon - Alcohol is toxic to nerves, and if you have diabetic neuropathy, drinking may spur on pain, tingling, and other symptoms, says the ADA. Drinking distracts your liver; and it simply won't start working to level your blood sugar until it sweeps the alcohol from your blood stream. 6. Eat less fat - Nearly 9 out of 10 adults with type 2 diabetes are overweight, says the ADA. Weight loss can help controlling blood glucose , and reduces the load on your feet which might be already sore from nerve pain. 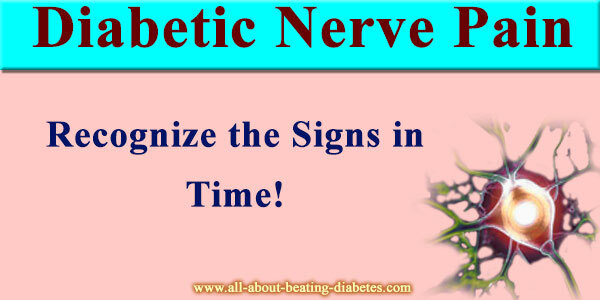 How to recognize in time the Diabetic Neuropathy Symptoms?